Aimée Dudley doesn’t just want to be a scientist, she has to be a scientist. At least that is what her lab colleagues at PNRI say. 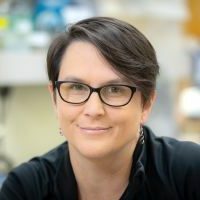 Aimée is an expert in yeast genetics, and her lab at the Pacific Northwest Research Institute (PNRI) includes nearly a dozen equally driven researchers. From finding ways to combat drug resistant fungal infections to developing methods for rapidly determining whether mutations in a human gene are harmful, the Dudley Lab is a world leader in using yeast to address important biomedical problems. Earlier this month, Aimée was promoted to Senior Investigator, the equivalent of full professor at an academic institution. Her drive to find new answers in the fight against human disease propels her work – and fuels the mission of PNRI. “As a visionary and creative researcher driven to conduct the highest quality science and to identify how her most promising discoveries can one day improve people’s health, Aimée embodies the spirit of our Institute,” said John Wecker, PhD, President and CEO of PNRI. In addition to her research in the lab, Aimée serves as a scientific advisor to FenoLogica Biosciences, a company PNRI helped start up based on technology from her lab. As PNRI’s Director of Educational Outreach, she partners with community groups to bring high school and undergraduate students from underrepresented communities to PNRI to explore science as a career. She also serves as a mentor to graduate students through her faculty positions with the University of Washington’s Department of Genome Sciences, Molecular and Cellular Biology Graduate Program, and Molecular Engineering Graduate Program. Learn more about Aimee’s visionary research.